This G1 Office Building sits proudly next to the City Chambers in the heart of Glasgow’s famous George Square. A redevelopment of the former General Post Office Building; this project created a 130,000ft2 of Grade ‘A’ commercial and high end retail space at street level to breathed new life into the Square. The design proposals involved the retention and vertical extension of the existing category ‘A’ listed sandstone façade and the demolition of the existing structure behind it. The demolition works were complex in that originally the post office building occupied the full city block. However, in the 1990’s the rear portion of the site was sold o and refurbished to provide luxury apartments. In demolishing the office site the frame, which was common to both sites, had to carefully cut away. The building proposals allowed for Grade A offices from first floor up with food retail to the ground and new double basement for parking. This necessitated deepening the existing basement in an area of high water table which required the construction of a new secant piled wall with active dewatering of the saturated, sandy ground conditions and the works were successfully undertaken without detriment to the neighbouring buildings. Following construction of the basement, using watertight concrete, a new nine storey steel frame was constructed and tied into the existing façade. 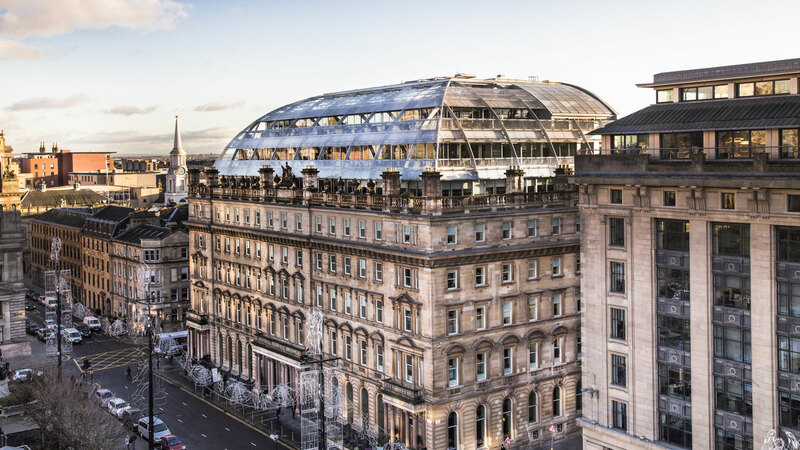 The frame steps back on the upper three floors, and the signature steel and glass ‘occupied roof’ creates the curved profile which has become a much-photographed addition to the Glasgow skyline.